The Washington County Courthouse in Sandersville, Georgia was built in 1869 and added to in 1889 and 1939. Sandersville, Georgia (pop. 6,200), county seat of Washington County, was created in 1796 and incorporated on November 27, 1812. The first county courthouse was built at that time. Once known as “White Ponds,” the town was the crossroads of Creek Indian trails and included a trading post owned by Mark Saunders (for whom the town was later named, with a spelling change). During the early 19th century the town was slow to grow; in the 1840s the Central of Georgia Railroad proposed construction of a rail station in Sandersville, which was furiously opposed by local inhabitants. The railroad was therefore forced to locate in nearby Tennille, and that town prospered as a result. By 1864 Sandersville still had a population of only about 500 people. Sandersville’s first public school opened in 1877, and in 1880 the first city hall was built. In 1893-94 Sandersville got an economic shot in the arm when the Sandersville Railroad was built to connect Sandersville to the city of Tennille and to Kaolin, Georgia for loading fine white clay (kaolin) and other mining products. In the two decades between 1890 and 1910, Sandersville rapidly grew. Many brick buildings were built around the square, and stately homes were constructed on the fringes of Downtown. The city has promoted the preservation of its built environment through participation in the Georgia Main Street program and by pursuing listing in the National Register of Historic Places for many of its eligible properties. In 2005 the historic African-American T.J. Elder School received a $20,000 Georgia Heritage grant to repair the roof and the foundation. In 2006, the historic Old City Cemetery was awarded an $18,000 Georgia Heritage grant to help with Phase II of the cemetery’s preservation plan. The city also applied for and received a Preserve America subgrant through the State Historic Preservation Officer to develop much needed signage and a new brochure for the Old City Cemetery. 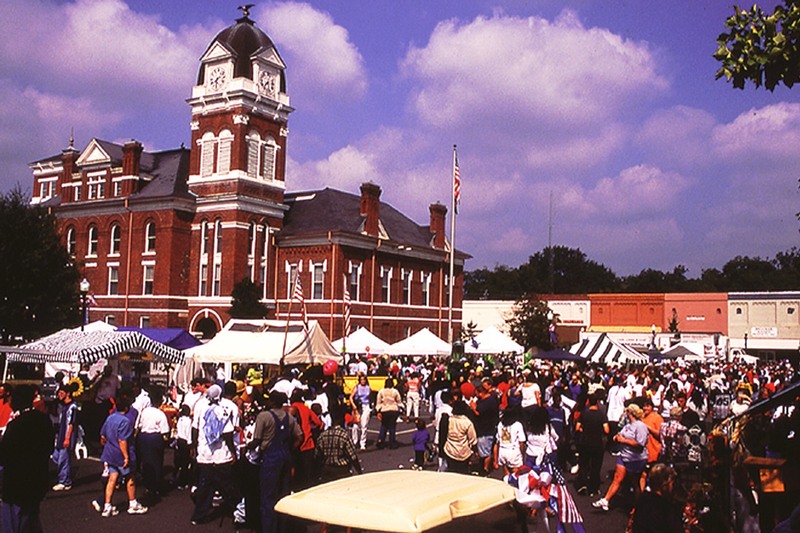 Located halfway between Atlanta and Savannah, and between Macon and Augusta, Sandersville’s heritage tourism efforts are linked directly to these projects and are also reflected in the city’s revitalized downtown business district. This revitalization has been spearheaded by the successful Main Street program, and revolves around the historic county courthouse, a strong community landmark. Washington County is known as the Kaolin Capital of the World, and an annual Kaolin Festival occurs each October. The city, and particularly the Old City Cemetery, is featured in the March to the Sea Heritage Trail (a Civil War driving tour) that recognizes Union General William Tecumseh Sherman’s campaign in 1864.